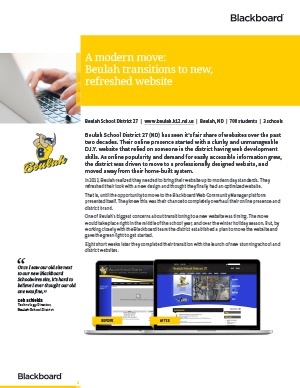 Beulah School District 27 (ND) took advantage of the opportunity to update their old, outdated website by moving to Blackboard's new Web Community Manager. Within eight short weeks, they refreshed all their school and district websites with stunning responsive designs, trained their staff of 60+ teachers, and are looking forward to watching their community and family engagement grow. Download the full story to hear more about Beulah's entire transition experience from their own technology team. Copyright © 1997 - 2017. Blackboard Inc. All rights reserved. Blackboard, the Blackboard Logo, BbWorld, Blackboard Learn, Blackboard Transact, Blackboard Connect, Blackboard Mobile, Blackboard Collaborate, Blackboard Analytics, Blackboard Engage, Blackboard Student Services, the Mosaic logo, Behind the Blackboard, and Connect-ED are trademarks or registered trademarks of Blackboard Inc, or its subsidiaries in the United States and/or other countries. Blackboard products and services may be covered by one or more of the following U.S. Patents.